Ionesco. Rush. Armfield. What a potent combination. Minds whirred at the prospect. Tickets sold in streams, and for good reason. Exit the King heralds the return to the boards of one of the most exciting partnerships in Australian theatre, Rush and Armfield, with their new translation of Ionesco’s classic. Exit the King is a wonderful text. 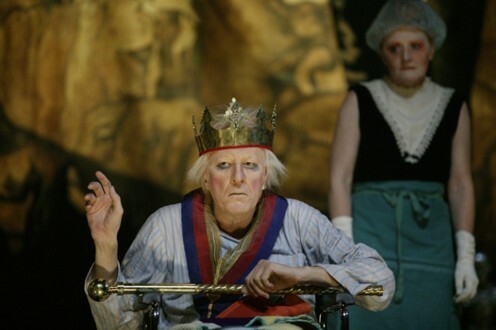 Written in the 60′s on the heels of the slow decline of the British Empire (and the ascendancy of the American variety), the play posits the material decay of a kingdom in parallel with the ailing of its monarch. As the King’s life, held on to with the tenacity of a bulldog, leeches away, that which he has ruled over begins an inevitable slide towards oblivion, in an almost solipsist act of vanishing. Ionesco’s absurdism is excellently realised in this new translation, and has found an appropriate vessel in Rush, who delivers a nigh faultless performance. His Berenger is a sublime act of continuous motion, like an engine long expected to have given up the ghost but that nonetheless sparks and turns over in the face of all reason and physic. His knack for physical comedy, rarely given free expression in his screen roles, is evident here in spades and makes full use of the extended space a reconfigured Merlyn Theatre allows. It is a treat to behold. The supporting cast, however, present a different picture. Gillian Jones in particular failed to elicit much life from her character, Queen Marguerite. It felt as though she had made the choice to be aloof and detached, with the result being that we saw a detached actor. Her vocal energy was lacking, and her consonants sloppy; whether this was a side-effect of the show being miked or not, it was highly distracting, and only somewhat redeemed by her gentle and unaffected presence in the final movement. Billie Brown served well as the royal doctor, alternately sympathetic and vindictive, but occasionally seemed to push towards the end of his thoughts; Rebecca Massey as the second, younger wife of Berenger, Queen Marie, started in an emotional wash that thankfully found its depth by the second act, and Julie Forsyth was sharp and precise in her delivery of the put-upon serving woman. David Woods as the Knight at arms is awesomely inappropriate in his pronouncements, and is wonderful in his monologue that links the everyman to his monarch. Set and sound are fantastic. The space is uncluttered but dynamic, and the use of reel-to-reel and live trumpet is aurally provocative, providing a certain fidelity that charms the ear – though on occasion the actors seemed to have to struggle unnecessarily to be heard over the fanfares. Dale Ferguson’s costumes see the two Queens sweep across the space as though their trains are constantly redrafting their personal borders around Berenger. Armfield’s direction allows for the grandiloquence and pity the text demands, though occasionally the rhythms seemed slightly off, as though the cohesiveness of the production was still working towards its distilled essence. Nonetheless, the orchestration of the final movement unfolds wonderfully. Despite comments to the contrary, this final section seemed the most finely realised, with the dark magic that lies at the heart of Absurdism given time to reflect upon us from the heart of its hall of mirrors. With the above criticisms in mind, it is nonetheless a fascinating production that elicits strong responses from the audience. The nature of power, of being, of love, and of madness are all radiantly present – with just the right degree of fragility, like an ice-crystal that could melt in your hand. With this review relating to the last preview before opening, it will be interesting to see how over the coming weeks the show may mature and find its stride. It may then become a diamond you’ll want to hold on to forever.